Dana Andrews, arguably the finest minimalist actor of his generation, as one critic commented, could convey more with one look than many actors could with a soliloquy. In a film career spanning nearly five decades, Andrews appeared in some of Hollywood's most prestigious productions, including The Ox-Bow Incident (1943) and The Best Years of Our Lives (1946). 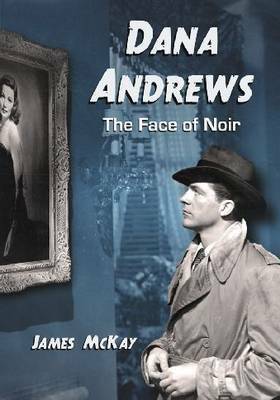 His unique screen presence was shown at its best in such film noir classics as Laura (1944) and Where the Sidewalk Ends (1950)..Beginning with an absorbing biographical chapter, this critical survey of Dana Andrews' screen career features a complete filmography with synopses, reviews, behind-the-scenes anecdotes and insightful comments from Andrews and his coworkers. A chronological list of television, radio and theater credits is included. James McKay is a chartered surveyor residing in Northwich, Cheshire, England.